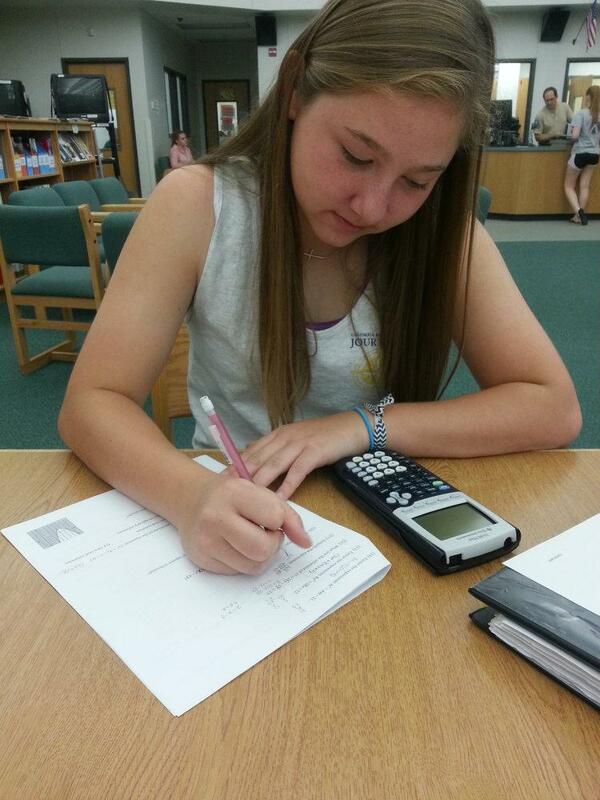 Kelly Wilkerson studies one last time in the library for her Quality Core Algebra II exam on May 30. Kelly Wilkerson, a sophomore at RBHS, is a student athlete, among many others who miss class time due to early release times for sports. Wilkerson participated in the Junior Varsity team for both basketball and soccer during the winter and spring seasons. “I missed three of five classes for one unit in my [Honors] Algebra 2 class [due to soccer]. I was pretty far [behind]. I had to go in everyday before school, sometimes after school, before practice, just to get help because I was very lost,” said Wilkerson, talking about how sports have affected her grades in a negative way. Organized sports can help kids grow in many ways. From soccer to fencing, sports offer chances for kids to learn and master skills, work with their peers and coaches, and challenge themselves in a safe environment. They learn the value of practice and the challenge of competition. And on top of all that, sports provide natural and fun opportunities for kids to get regular exercise, according to kidshealth.org. But one thing that we don’t realize is how sports can affect kids in a negative way. RBHS dismisses student athletes early from class to get on a two hour bus ride to an athletic event and sometimes getting home at midnight. Athletic Director David Egan, says the sports schedules are coordinated through other athletic directors and coaches based on dates, other games, and whether it will be held home or away. While Egan and coaches schedule away games, Wilkerson stresses about missing class time and losing hours in the evening from having soccer practice everyday after school until seven o’clock. “I went in beforehand and told [my teacher] I would miss today and I would go in the next day and say I would miss this day also, so she was willing to let me miss because of soccer. Then she would give me the notes but I would go home and do it and not completely comprehend it, and therefore had to go in and get instruction from her [on my own time],” Wilkerson said. It took Wilkerson more than a week to finally catch up on her homework, having 30 problems in just one night, and still missing classes and instruction. As far as she could tell, her teacher was not annoyed with all the class time being missed and her coming into the classroom all the time, asking questions on the work. Wilkerson didn’t ask her teacher if she could schedule another day to take the test because after hearing fellow student athletes ask her the same question and she said no, she figured the response would be the same. Cassandra Lynch, sophomore, says for most her track meets, she is dismissed at 12:00 o’clock for away meets, missing third and fourth hour, which for Lynch on B days is Spanish 2 and Honors Chemistry. “I’ve missed 10 classes, maybe. I had a lot of makeup work in those classes because they have a lot of packets. I’ve missed two chemistry tests and three Spanish quizzes. [My teachers] are very annoyed. Whenever we have to leave, they’re like ‘ugh’ or they sigh and roll their eyes,” said Lynch. Missouri State High School Activities Association (MSHSAA) has a byline law that governs the amount of instructional times that teachers who are also coaches are allowed to miss, and Egan abides by that. Egan tries to factor in students missing class time but RBHS does not have a conference, meaning they scramble to find teams to play. Unfortunately the two hour drive to St. Louis or Kansas City, Mo. is where the majority of the competition is, dismissing students at around two o’clock usually. Teachers are not required to give students make-up time but it is the school’s expectation that they do give students equal time to make up any work that they have missed, Egan said. Although they should be lenient, it is advised that students notify their teachers a day before they will be missing class to get that work. Although it is recommended, Wilkerson, along with other athletes, knows how difficult it can be to miss even if you make time to go in before and after school to get help. Does your sports life affect your grades? Randi Obermiller is a military brat and world traveler. After moving around nine times and experiencing the Air Force life because of her father, she is determined to join the Air Force herself and serve the United States. Playing soccer, doing math homework and taking photos are some of her favorite things to do, but they all take second to watching baseball.